Francis Robbins went to the gold rush and was never heard from again. John Hankins’ father’s name was Tom, and his mother was a 4th wife. Jennie Lawrence was Ethel Robbins’ step-mother and sister-in-law at the same time. Oh…by the way… Emma Lawrence’s real name was Minerva Jane Kibby. 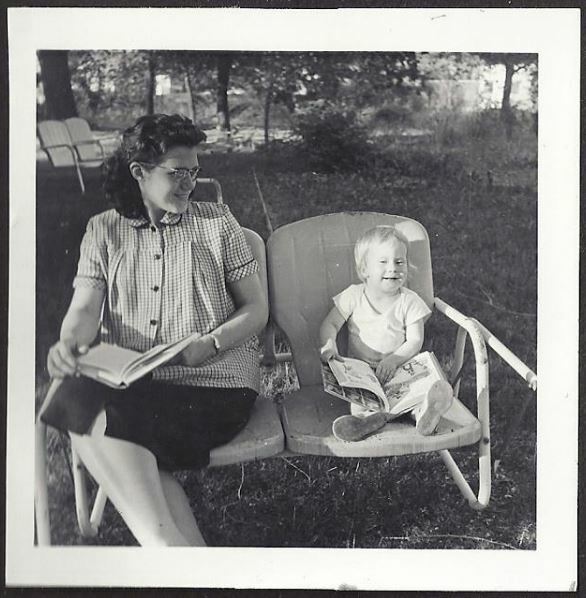 My mom loved reading books, figuring out puzzles, and perusing maps – me too! These are ideal genealogist qualities — gifts — that she passed along to me, along with a sense of curiosity and wonder, and a belief in myself and my abilities. Along with a few keepsakes, of course. She was always eager to learn about my latest discoveries, and I am grateful for the two genealogy research trips we were able to take together before she died, ignorant of what was to come all too soon. She loved to travel — me too! — and another trip I am grateful for was our trip to Paris, just us two. Together we visited libraries, city halls, and distant relatives in KY, TN, IL, and IN… and, on another trip, CT and MA. And we visited graveyards, which meant walking around in nature, which she loved — me too! Graveyards are quiet and often quite scenic. I just noticed I am saying “graveyard” instead of cemetery. I suppose it’s because the kind we visited were often rural and quite small and informal. Like in a cow pasture. No, I’m not kidding. I think she would be thrilled for me to use this photo of us reading together, one of my favorites, to draw attention to my Family History Research Services. Thanks, Mom! Do you think it’s a little late to be writing about my mom if want to sell genealogy services? Especially as a Mother’s Day gift for your mom? Well, it’s not. Because family history never ends. And I offer gift certificates. And it’s never too late. Well… it’s a great gift for many occasions — birthdays, anniversaries, reunions, etc. — but nothing is certain. Don’t wait. And it’s also never finished. There’s always a new branch to discover on your family tree! What gifts did you get from your mom? Are you curious about your family tree? Are you the family historian? Are there any family mysteries I can help you solve? I think this is a lovely gift idea, Hazel! We have a couple of historians in our family, and I’ve been fascinated to learn my history. One thing for sure… I can’t trace my heritage to one nationality- talk about a hodgepodge! That just makes it all the more interesting! What a beautiful tribute to your mother! I love hearing how she influenced the path you’re on today. Great post Hazel! Such a sweet post, Hazel. Your mom sounds like she was a wonderful lady. My mother is a pretty organized person and I definitely got that gene. She’s also a dancer and passed down her love of music, movement and rhythm to me. My little guy seems to have gotten that gift as well as he’s always singing! It’s amazing what’s passed down through generations and so important to capture. Thank you for sharing this post. It makes perfect sense to me that you are from a Quaker background. My experience of you is one of patience, peacefulness, and kindness. Those are qualities I associate with Quakers. Also, I was once acquainted with someone who was a Quaker and you remind me a bit of her. Indeed your mother would be very proud of your accomplishments and the kind of person you are. If I met your mother I would tell her what a great job she did. (Moms never get tired of hearing that.) Happy Mother’s Day, Hazel. My mom was an only child, but her mother had a very large family, and I think she once told me she had 22 first cousins on that side of her family alone. At one time I asked her to write it all out for me, but unfortunately by then she was in poor health, and her medication was interfering with her ability to concentrate enough to do it. I understand some of my relatives have been doing some research in that area and I intend to get in touch one of these days. The best gift I got from my mom was my love of reading. When she was well, it wasn’t unusual for her to read a book a day. One time when I was a teenager I went to the library andshe asked me to pick up a book for her. I protested, saying I wouldn’t know what she would like, and she said it didn’t matter as long as it was thick. I don’t remember what I brought her, but she was delighted. What a wonderful tribute to your mom! I think some of the gifts I got from my mom include being a strong independent (some might say bossy) woman who can do it herself when needed and a strong desire to bring our far flung family together on a regular basis. Family is everything. What a lovely tribute to your mom and your family history. I love the discovery process you’ve shared. My mom is still with me, which I’m very grateful for. She’s the only parent left as Steve and I have lost our other parents in these last years. There’s a laundry list of things my mom gave to me…simple things like the love of black licorice and coffee ice cream, to the deeper ones like the importance of family, helping others, gratitude, and creativity. She has dementia, so each day can bring its set of challenges. Some days she is a different person, and some days or moments she is the mom I’ve always known. I am grateful for ALL the moments, challenging and sweet, because I know that there will come a time when only the memories will remain.